Gion (祇園) is one of the most popular tourist spot in Kyoto. It is located eastern Kyoto around Yasaka Shrine. There are many Kyoto style houses which also used for restaurant, teahouse, and hotels, and most of them are established restaurants and hotels. Those houses and their area are preserved as the important historical buildings and historical Scenic Beauty. 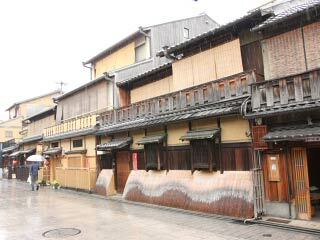 Therefore, the famous scenery of Kyoto is actually the view of Gion. Gion is the best place to walk around with Kimono in Japan. There is no parking or public bathroom. 1. use city bus 206 or 100 to Gion. Gion developed as Monzen Town (town for visitors of Shrine or Temple) of Yasaka Shrine. When you imagine of Kyoto, you actually imagine the scenery of Gion. Gion developed from the Shijo street to north and south. Geiko, wildly known as Geisha, and Maiko performs at the restaurants and hotels in Gion. The northern area around Shirakawa river and Shinbashi street is one of the best scenery of Gion. The view of this area is preserved as the important historical buildings. The view of Tatsumi Bridge is one of the best view of Kyoto. Beside the Shirakawa River, there are many established restaurants. ... is the main street of Gion. It runs from north to south about 1km long. South side of Shijo Street is one of the most famous spot in Kyoto. There are many Kyoto style houses which are also very established restaurants, tea houses and hotels.